It’s the Little Things « You know… that Blog? It really takes so little to make me happy. Really and truly. Impromptu tickle fests with my sleepy-eyed kids on my giant king-size bed, a quiet moment with my husband, singing with my friends… little things. I don’t need extravagant gifts, flowers, accolades or awards. I don’t need people pounding me on the back for doing what I’d be doing anyway, recognition or not. No, it’s the little things that make me happy. Things like having J-B, ShaMoo and Knarf participating in our weekly Haiku… You too, of course, but getting them involved was not an easy feat. I never thought I’d see the day when incredibly busy, poetry-shy ShaMoo would take a moment to count on her fingers and shoot some sweet thoughts my way. Really never thought J-B would ever start frequenting my blog, or write the gorgeous (and steamy) haiku he’s been coming up with lately. In fact, he [for whatever reason] makes a point of telling me just about every week that it’s not high on his priority list. Funny how he still manages to show up and leave something wonderful, though, isn’t it? I am pretty sure he enjoys and looks forward to it more than he’ll ever admit. Knarf – well, no surprises there. Knarf is a huge romantic, and his poetry reserves are bottomless. Plus he and ShaMoo have this incredibly funny rivalry going now, that pleases them both to no-end. Bottom line though, they all do this because they know it makes me happy. It pleases me to know that I’m worth spending a few moments on every week. 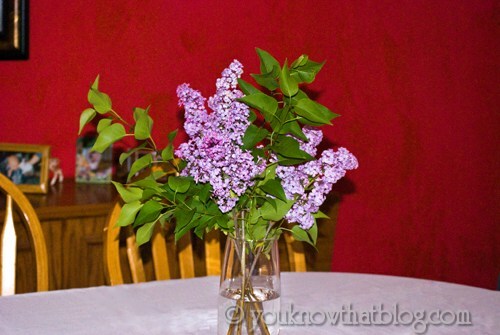 Today I cut a bouquet of lilacs for my kitchen table. What makes this such a wonderful and noteworthy thing for me is that this is the first time since I planted these lilacs that all three of them have bloomed. Two of them I planted 7 years ago, and another one 3 years ago. Every spring as all the trees start to bud and get ready to bloom, I wistfully inspect these 3 for any sign of flowering. The tiny one had a single bloom on it last year. I didn’t even cut it because it was so hard-won that I wanted it to last as long as possible! This year with our early spring, I was so excited when all three of them showed signs of flowering! The older ones now have tons of blooms, and the little one has a few. Just getting a light whiff of their heady scent makes my heart soar. What little things make your heart soar? .-= quilly´s last blog ..Pizza Winners Announced! =-. .-= Thom´s last blog ..55 Flash Fiction Friday – 5/14/10 =-. Lilacs are high on my list…and Fridays, too! Currently a bird is building a nest in the tree right outside my kitchen window. It thrills me to no end to watch. my carpet truck coming early – especially on Friday! Visiting my mother — I will miss her when she’s gone. .-= Nancy ´s last blog ..SWS – First Iris Of Spring in Bloom =-. My granola, with yogurt, every morning. A good laugh from a clever turn of phrase. A half-hour with a good crossword puzzle. A page from a good book, beautifully written. The smell of dinner when you walk through the door. A woman can never have too many flowers or too many sweaters. Hear hear! I agree with all of that. .-= Doodle Cakes´s last blog ..Hyundai Genesis Coupe Cake =-. Oh LILACS! There was a bunch of lovely lilacs on the staff room table where I was working recently and I would go in and take enormous, dizzying whiffs several times per day. Each time I would talk myself out of stealing them away back to my private office. I’d like to say it was my desire to share, but really my office has a rather large window in the door that would bust my lilac thievery. .-= MOMSICLE VIBE´s last blog ..Stink Bomb =-.